I always imagined myself a missionary. I never imagined myself a pastor’s wife. Never. Ever. Warning; I need therapy, counseling, etc. Until then, I’m blogging. It’s cathartic. 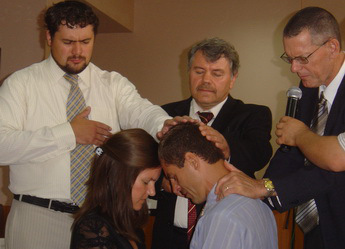 Vitaliy was ordained as an evangelist in 2009, and he was *one* of the 3 pastors of our church. He was not the main pastor. We came back to Ukraine (from a visit to America) around 2010, and while we’d been gone, our church had exploded. I can’t write details. It’s like big-legal-trouble details. And the sad/key thing is that it all involved the informal and formal leadership structure of the church. There’s a lot I’m not going to write (you can thank me) because I have, cyclically, worked through forgiveness issues. I will just say, it was a baptism by fire into being the main pastor and his wife. It was having to do *at least something* with unrepentant or sadly trapped leaders. It’s been six years, and the fall out is still hanging around. Maybe it’s me. Maybe I’m pathetic. But here’s my today thing: In order to grow normally spiritually, I want/need to start enjoying my church again. I’ve dealt and am dealing with the forgiveness, the patterns of rehearsing their sins in my thoughts. I’ve committed to keep a guard over my mouth and stop the damaging, internal dialogue. Now I really want to start just liking them all again. So, how to go about nurturing and re-creating “like”? 😀 It’s a cool question. …. I may be back with more. Bless you, my Anne-friend. And I look forward to you sharing more of how you go about re-creating “like”. Dear Anne.. i have walked my own trail of deep pain..You are well on your way..the commitment to stop the powerful internal negative..is step one.. I had a group of people that I would text daily when I could not stop it on my own and all I asked was that they pray with and for me wherever they were. They did !! and in time one day at a time, I was able by God’s grace to see new things I liked about them, or remember positive things they had done in the past. An intentional focus on God and asking His help to see through His eyes again..brought slow steady healing til one day I could see things I liked and loved again. Praying for you!